Weekly Transit Roundup: Envision SIlicon Valley, BARTs Longer Trains – Peninsula Moves! Help Shape the Future of Silicon Valley Transit: The Santa Clara Valley Transportation Authority (VTA) is actively discussing the possibility of placing a tax measure on the 2016 ballot that will help pay for improvements to transit, highways, roads and pedestrian and bike thoroughfares. To help prep for that potential initiative, the VTA has launched Envision Silicon Valley, a process where residents and community leaders can discuss future transportation needs and identify solutions on how to fund them. As a part of the Envision Silicon Valley program VTA had established a new website, http://www.envisionsv.org/, where residents can view the trade-offs between spending options and new revenues, along with important statistics about transportation in Santa Clara County. The interactive website offers plenty of opportunities for participants to provide their feedback and input on the future of transportation in the region. Summer is in Full Swing in San Mateo: Although it’s still relatively new, SummerFest has become a staple in San Mateo. The third annual street festival will take place this Saturday and Sunday from 10 a.m. – 6 p.m. 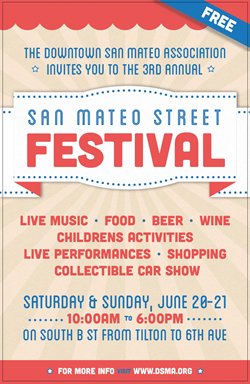 Presented by the Downtown San Mateo Association, SummerFest will feature live music, craft beer and artisanal food creations, children’s activities, shopping, cooking demonstrations and an assortment of other live performances. Located on B Street between Tilton and Sixth avenues, the free festival is just a short walk away from the San Mateo Caltrain Station. Caltrain’s weekend schedule offers hourly service to the station, along with four Baby Bullet express trains. BART’s New Budget Includes Longer Trains: As passengers on Caltrain are well aware of, the improving regional economy that puts more customers on transit is also taxing the Bay Area’s public transportation agencies. In response to nearly five years of monthly ridership increases, Caltrain purchased 16 new rail cars to help deal with capacity issues, and has begun running six-car trains in the morning (an increase from the normal five-car trains.) BART, the regional train operator that connects passengers from the East Bay to San Francisco and points on the Peninsula, is also experiencing issues of overcrowding, and as a result, has opted to invest in increased service and longer trains as part of its $1.6 billion budget for the upcoming fiscal year. The train agency will add a car to some of its midday trains, and an extra hour of weeknight service on its line connecting Millbrae to Richmond. The service enhancements were unanimously approved by the agency’s board of directors on Thursday.